Discussion in 'Apprentice Marijuana Consumption' started by M369, Jun 7, 2009. 2. Back flip/ backwards rolled joint. 3. A different way to make your build. Coming soon. 4. Double Kingsize. Coming soon. For a while now i have been saying i will make a guide in how to roll. I consider myself quite good at it and would love to share some hints/tips and methods with the people of GC. 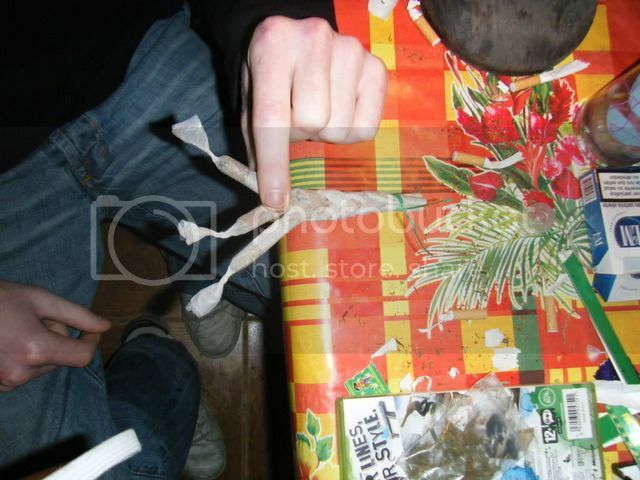 The first thing I'm going to show you is how to roll a perfect spliff/joint. I will add other rolls and different shapes and sizes etc at a later date, but am starting simple. First things first you will need to grind your weed up. Second is quite an important part which people don't normally take care with. In placing your weed inside your paper, be sure to spread it out in the desired shape of your joint before you start to roll. This makes things a lot easier. Roll your roach and place it at the end. One important rule i go by is. Never remove your thumb and index finger from the roach until you are finished rolling. They are a stabiliser for your joint and its important to keep them on the roach. Your other hand is what you will be rolling with. Keeping your right(left for leftys) hand where it is. Carefully and slowly roll with your left hand being sure to keep the joint at a slight angle so to not over spill any bud. Roll up and down until you have the shape you want. Keeping your right hand on the roach, but still rolling it back and forth. Try and get it as tight as you can before licking it. You need to keep rolling with your right hand on the roach. (like how you roll a piece of paper) And tuck the paper under the roach. Now time to lick the gum. And using your left hand roll the rest around as tightly and carefully as possible. Still keeping your right hand on the roach. NOW you can remove your right hand and lick the rest of the gum. And your ready to smoke. Again i apologise for the bad picture quality. I will update when i can. And share some other rolling techniques and methods soon. EDIT: I changed the pictures because the quality of the others was poor. Another way to make your build. If you are struggling with the first method of rolling you might want to try this one. The exact same goes for the rolling but the way the build is made produces a more defined cone shape and also slightly lengthens the joint. Some may also find it easier. Start by joining 2 papers like this. Carefully tear off part of the upright paper so it looks like this. Roll it the same as the first method and simply wrap the extra paper around. It will automatically make a cone shape. This isn't the best methods of smoking. If i'm being honest it didn't hit as well as a blunt or a good cone, but the novelty of it is fun, and it looks awesome! First of all you need to roll 3 joints all the same size.... The BIGGER the BETTER! The rest is quite simple! Find a way to attach the 3 roaches together. We used a peice of wire covered in plastic, but a rizla would work fine. Tie them together and slowly and carfully braid them. Just as you would with someones hair. Just remember to be extreamly careful as you don't want to rip or tear any of the joints. Keep braiding it all the way to the top. Just a few more rolls..
First decent roller I've seen in a while, I hate smoking spliffs/blunts that aren't cones. I agree. I think cones are one of the best ways to smoke something which has been rolled. Makes the smoke so much nicer. Nice joint man, smooth. Its weird though, we're both right handed, yet when im rolling I have the roach on the left hand side of the paper, keep my left finger and thumb on it and roll the rest with my right. Yeah i guess thinking about it i can roll with both sides. lol. The picture quality is a big shame. I will roll a king size and post the guide soon. They are much more impressive. very nice lookin man... cant wait for more ! Thanks man. More coming soon. Not my personal favourite but they get the job done. One of the best rolls i've seen nice job Mat. We should play some Halo sometime! Need to update it soon. Heres a pic of my last joint. Man, I personally never learned to roll cones. I almost always roll with 'Zag Kutcorners anyway, pretty bunk trying to roll a cone in standard size papers. I don't roll often anymore but I can still roll a basic J as straight as a cig... though I don't put my mouthpeices in first. I save it for post-work. When AFD and I want to smoke a cone we go pick up a Cyclone wrap ^^. Yeah man. It's whatever works for you. The idea of this thread was to show loads of different techniques and shapes of rolling. I guess i got lazy and forgot about it. Il do it soon tho. Yep a few of us joint rollers are still here. Definitely man! Post it up, il look forward to it. If you have a guide be my guest too. Back rolled joints was on my to do list. It's a real good way to show off . And a lot of people have no idea what they are. The Back flip/ Back Rolled Joint. I rolled one last night. I only ever do them when i don't have much weed left. To me it's a good way to smoke a spliff with a small amount of bud without all the paper. The idea of a back flip joint is to roll with the gummed part of the paper on the outside. Then burning off the excess paper. Il show you in some pics. It's no the best of rolls. But i don't do these type too often. Like anything, practise makes perfect. So first you need to make sure the gum part of the paper is on the outside instead and facing you. Now its the same method of rolling as used in the last guide. Keep your Right(or left) hand on the roach and don't move for the duration of rolling. Roll up and down with your left hand as before. At a slight angle so nothing falls out. Once you get your ideal shape it's time for the different part of this rolling. The gum should be in position like in the picture. Lick it not being afraid of saliva. You will need more saliva using this method as it's much more difficult to make it stick. Tuck the gum in and away from you and bring the excess paper around. Making sure the Gum has stuck well. If you have to, then lick your finger and run it down the back of the joint for extra stick. Let it dry for a bit as its normally slightly wetter than usual. Then tap it down. Now you need to get rid of the paper your not using. Blow off the ash and clean the joint up. And enjoy your back flip joint. With minimum paper used. wow ive never tried rolling that way, nice roll. also im left handed, i do it backwards. ill take pics tomoro when i roll up and post em. its 7 in the morning and i havent slept yet. wouldnt it be better to just trim the paper with snipps or just roll it around? Yeah snipping it off will work fine too. Burning it does leave a singe mark which doesn't look very nice . But it's quite quick and easy to do and doesn't effect the smoking. Wrapping the rest around would make it pointless, as your trying to smoke a joint/spliff with the absolute minimum amount of paper. Noob friendly guides for rolling? Perfection in rolling a blunt?? Any guides to rolling a blunt?